Join us for our FIRST Northern Arizona Public Policy Roundtable! Cost: Free to attend, but RSVP is required. Engagement in advocacy and public policy, both at the local and federal levels, is no longer an option as issues impacting nonprofits are ever increasing, and the need for well-informed and engaged leaders and communities is critical to the furthering of our missions. The Alliance formed a statewide Nonprofit Policy Council several years ago to better engage and unite nonprofits on important issues facing the sector, and this group still convenes monthly to discuss and work on state and federal policy issues. We are currently working to expand the voice and representation of this group to truly reflect the diverse, statewide audience and community we serve. We invite you to join us as we expand to the Northern Arizona region with an in-person public policy roundtable in Flagstaff. This will be an opportunity to learn more about the Nonprofit Policy Council work, receive an update on current local and national issues, inform you of our upcoming 2019 legislative agenda, and to engage in meaningful conversation with your peers, Alliance leadership, and Policy Council volunteers. This first meeting of the roundtable will also include a special training session on the basics of nonprofit advocacy. Nonprofits and industry professionals have a vital role to play in educating and collaborating to advocate for our causes, programs, and clients. Contrary to popular misconception, nonprofits, public charities and other stakeholders can lobby, though not all advocacy requires direct action in the halls of Congress or at the State Capitol. Learn easy tools to help you become a better advocate and share your story and impact in our communities. 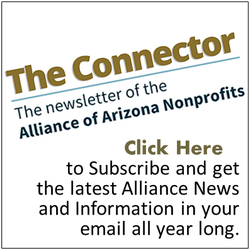 Our goal will be to form a group of nonprofit leaders in Northern Arizona that can participate remotely in our monthly statewide Nonprofit Policy Council meetings, as well as engage in discussion and work with their local peers through in-person meetings in the region. Kristen Merrifield brings extensive leadership to the Alliance, most recently serving as the Chief Operating Officer at the Arizona Small Business Association (ASBA), the largest trade association in Arizona serving over 10,000 small business owners and entrepreneurs. Through her previous roles at ASBA, the ASU Foundation and the Greater Phoenix Chamber of Commerce, she brings over 12 years of association and nonprofit knowledge and expertise to her new role as Alliance CEO. Kristen is an active participant in the business and non-profit community serving as a productive member and President-Elect of the Arizona Society of Association Executives; Silver Level Supporter, Board Member and Treasurer of Gabriel’s Angels; past board member of the Phoenix Workforce Connection; member of the American Society of Association Executives (ASAE); graduate of the ASU Lodestar Center’s Generation Next Nonprofit Leadership Academy; graduate of the ASBA Executive Business Mentoring Program; and also earned her Certificate of Association Management from ASAE. Kristen also holds the prestigious Certified Association Executive designation. She has dedicated her career to serving others and is a respected and well-rounded leader.